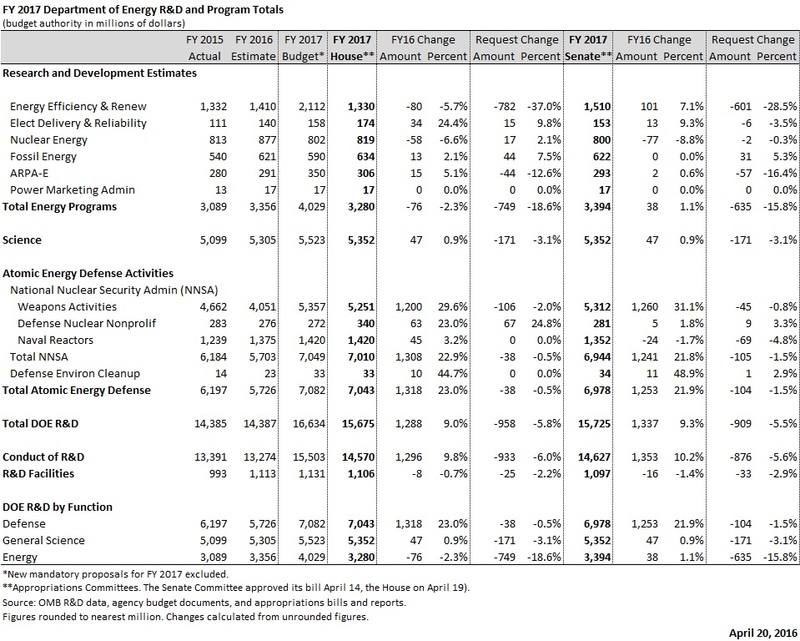 The National Science Foundation and Department of Defense basic science programs were also cut in a busy week for House and Senate appropriators. Multiple bills covering several science and technology agencies were considered this week in both chambers. In the House, appropriators continued to embrace select NASA exploration programs and protected the space agency from billion-dollar cuts proposed by the Administration, while trimming the budgets for the National Science Foundation, the Environmental Protection Agency, and climate research at the National Oceanic and Atmospheric Administration. The House energy spending bill failed to advance past the House floor, as both Democrats and Republicans attached policy riders the other side found unpalatable. 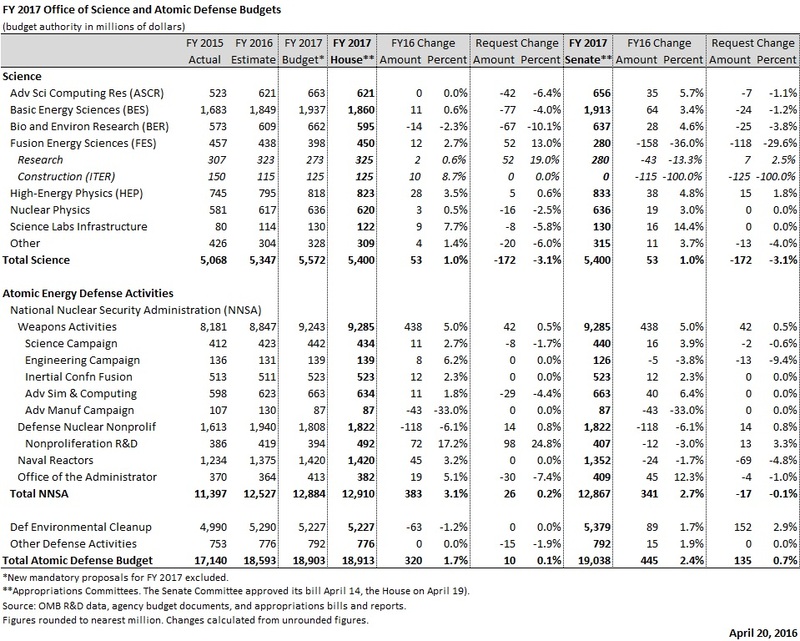 On the Senate side, appropriators partially, but not completely, spared Defense basic science programs from big proposed cuts. The queue for floor votes is beginning to lengthen as the number of committee-approved spending bills mounts. Late Tuesday, the House Appropriations Committee approved its FY 2017 CJS spending bill, which includes NASA, the National Science Foundation, and the Department of Commerce, on a voice vote. As reported last week, the bill allows NASA to dodge the billion-dollar cut proposed by the Administration, but does cut funding for the National Science Foundation (NSF) and the National Institute of Standards and Technology (NIST). It also sets up several debates with Senate appropriators that will have to be worked out during conference negotiations, assuming the Senate is able to pass its own CJS bill. While both the House and Senate bills reject the Administration’s NASA cuts, there is substantial variation between the two (seek graph at right), not least of which is the extra $200 million provided in the House. Once again, House appropriators boosted Planetary Science at the expense of Earth Science, while Senate appropriators took the reverse approach when passing their own bill; all of this is a repeat of prior years’ debates. Within Planetary Science, the Discovery small-missions program, Mars exploration, and, in particular, Europa mission funding all received substantial House boosts above the request. Within the Aeronautics directorate, appropriators provided funding for a project to develop quieter supersonic flight; NASA had originally included this project as part of its unorthodox mandatory funding request this year, but appropriators instead tucked the project into the base NASA budget (see this guide for an explanation). The bill also directs NASA to begin planning for an interstellar mission to Alpha Centauri within the next half-century. 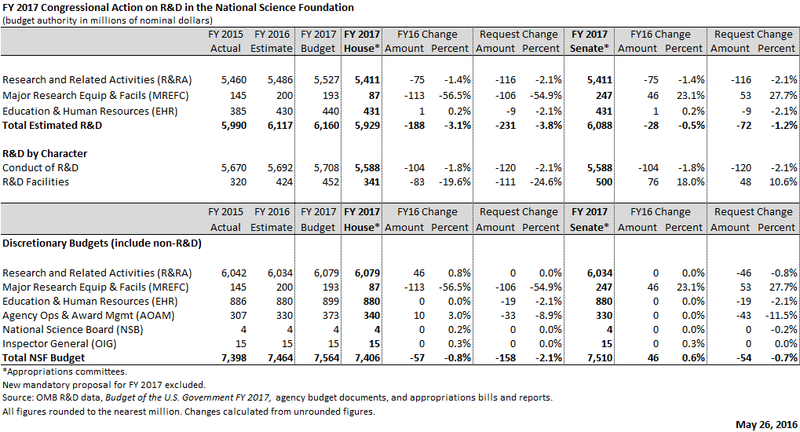 The National Science Foundation would be subject to a relatively small 0.8 percent budget reduction in the House bill. NSF’s research account would receive a small increase, matching the request, while appropriators entirely withheld the requested funding for new research vessel construction. House appropriators again cut funding for the National Oceanic and Atmospheric Administration (NOAA) research office, mainly due to a 19 percent cut for climate research. House appropriators did match the request for NOAA’s two major satellite programs, the Joint Polar Satellite System (JPSS) and the Geostationary Operational Satellite (GOES-R) program, while flat-funding the Polar Follow On satellite program at $370 million instead of providing the requested 6.2 percent increase. 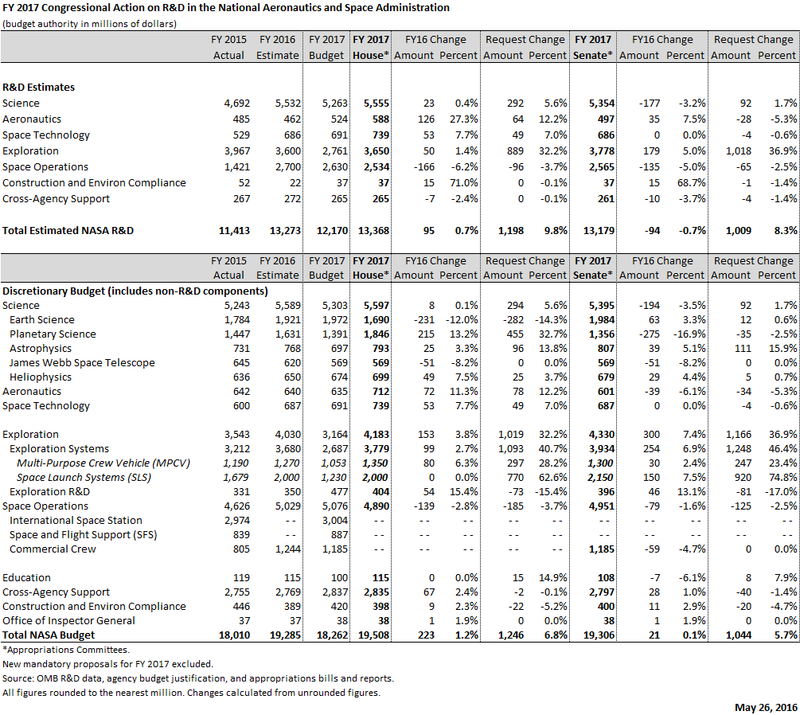 Unlike their Senate counterparts, House appropriators cut the National Institute of Standards and Technology (NIST) budget, mostly due to cut facilities and construction funding, though NIST’s research account would also be trimmed. The House committee also deeply cut the National Network for Manufacturing Innovation (NNMI) budget. The CJS bill’s next stop is the House floor. The FY 2017 Energy and Water appropriations bill unexpectedly failed its floor vote Thursday, largely due to policy riders. This week the House controversy is over homosexual, transgender, and religious rights among other things (the Senate version of the bill ran into its own trouble over Iran-related amendments some weeks back). 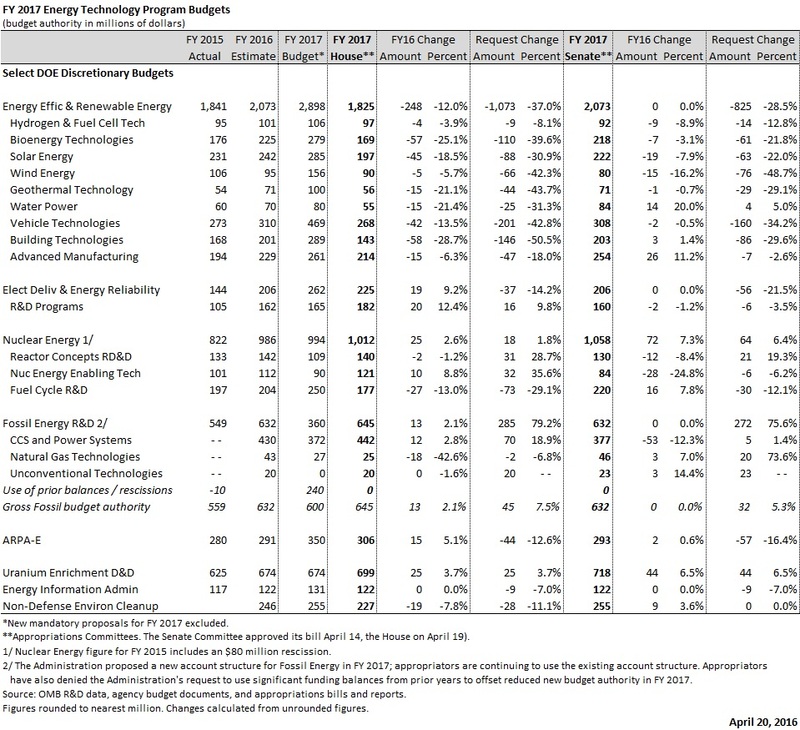 As previously reported, the House energy bill provides only a 1.0 percent increase for the Department of Energy (DOE) Office of Science; boosts funding for nuclear and fossil energy R&D, grid-related research, and the Advanced Research Projects Agency-Energy (ARPA-E); and makes deep cuts to energy efficiency and renewable energy funding. 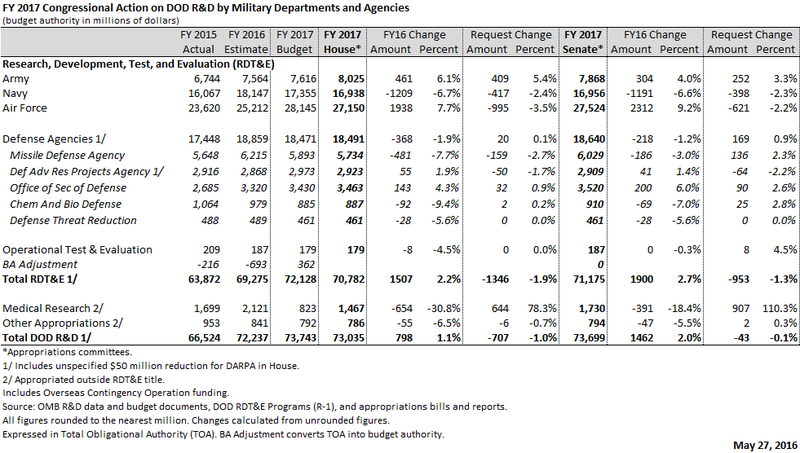 The House Appropriations Committee has passed most of its R&D-relevant spending bills already, but the difficulty on the House floor again throws the process into question. The Defense bill was unanimously moved by the Senate Appropriations Committee on Thursday following a subcommittee vote Tuesday. The bill provides the Department of Defense (DOD) with $71.2 billion in Research, Development, Test, & Evaluation (RDT&E) for FY 2017, a 2.7 percent increase above FY 2016 levels. 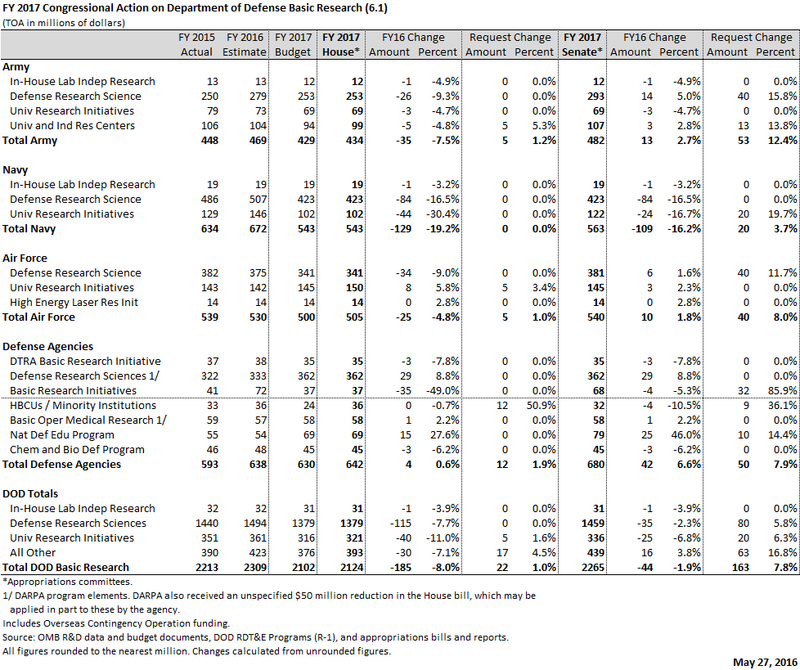 While the Senate Defense bill does not adopt the $200 million cuts to Defense basic research programs proposed by the Administration in February and embraced by House appropriators last week, it would still trim these programs by $44 million or 1.9 percent, primarily due to steep cuts for Navy basic science programs. 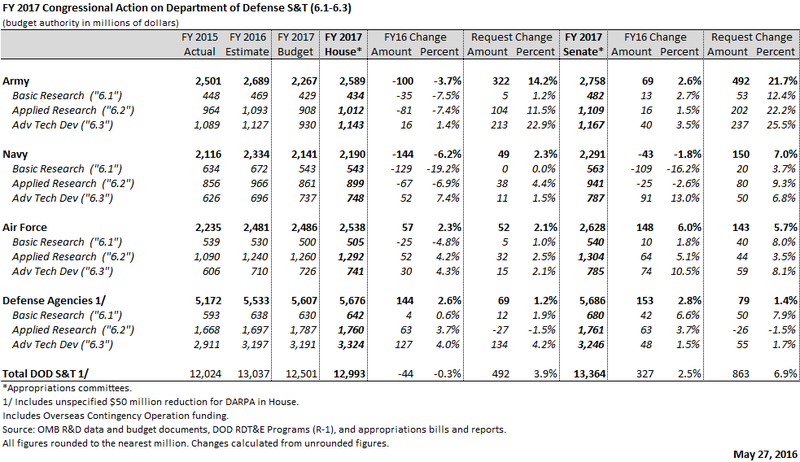 Overall, science and technology programs would fare far better in the Senate bill than in the House bill, or in the President’s budget, tough the Defense Advanced Research Projects Agency (DARPA) would receive a smaller increase at 1.4 percent, less than the rate of inflation. 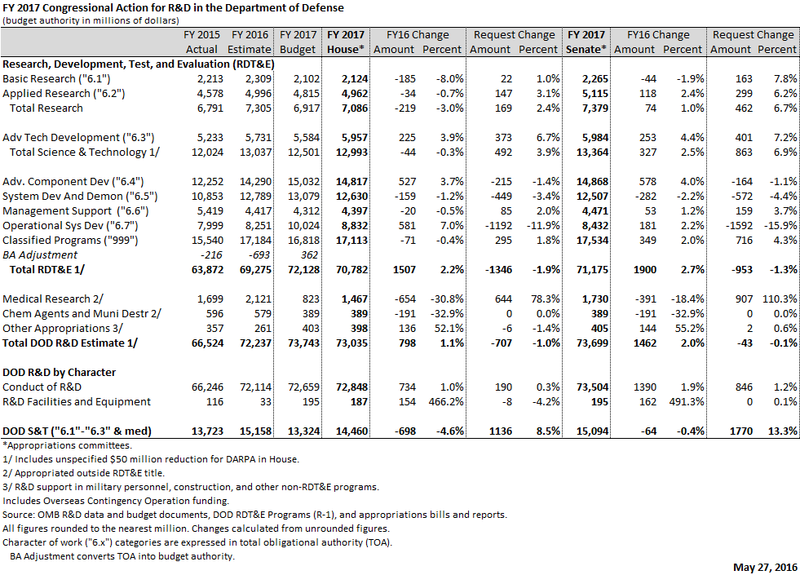 Senate appropriators also provided an extra $263 million more than their House counterparts for DOD medical research. Both bills now await floor votes in their respective chambers. 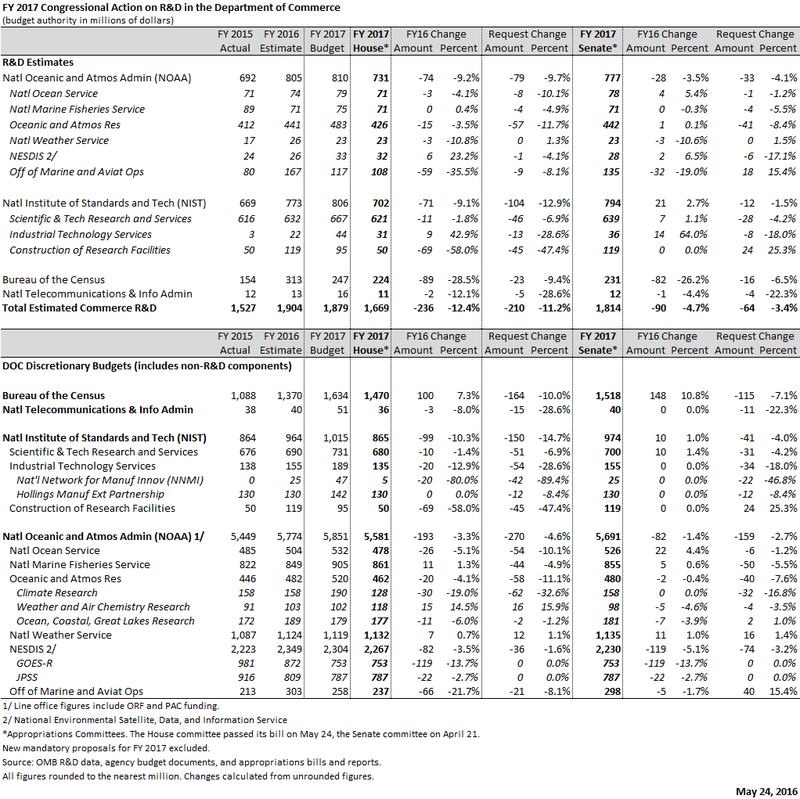 Senate appropriators granted the Department of Homeland Security (DHS) Science and Technology Directorate a very small increase of less than one percent in the Homeland Security bill unanimously approved Thursday, with a moderately larger increase for the directorate’s research accounts. Appropriators also granted a very small increase for the Domestic Nuclear Detection Office (DNDO). The Administration had proposed replacing DNDO with a new Chemical, Biological, Radiological, Nuclear, and Explosives (CBRNE) Office, but Congress has not yet authorized that new office, and so DNDO remains in place. Appropriators also declined to use the new appropriations structure laid out by DHS in the budget request, confounding quick comparisons. More details on DHS will be provided in future updates. On Wednesday the House Appropriations Subcommittee for Interior and Environment approved its FY 2017 spending bill on a voice vote. The bill provides the U.S. Geological Survey with a 1.7 percent funding increase – level with inflation – rather than the requested 10.1 percent increase. The bill also levies a two percent cut to the Environmental Protection Agency’s Science and Technology program, and virtually flat-funds the Forest Service’s Forest and Rangeland Research account as requested. A date for bill markup by the full committee has not yet been set.